A recent post featured a rather special seven day period in Newham - the borough's first Heritage Week. This one features a rather more ordinary week, in the life of Forest Gate. Our listings column (right) tries to focus on one-off events, or music within Forest Gate. We are always pleased to add YOUR event, free of charge, of course; just drop a line to info@E7-NowAndThen.org. The listings section, however, omits details of those dozens of activities that run as regularly as clockwork within the area. Many of them have emerged as initiatives initiated by recent "gators", or in-coming gentrifiers. But, an equal number, are long-standing sessions that have helped make the area what it is, for years. Many of these are provided by or with Aston-Mansfield, at Durning Hall on Earlham Grove, or at The Gate, by Newham Council. Below we offer a list of regular weekly activities in Forest Gate. We have deliberately omitted education/training courses and religious-related activities - these would take a lengthy post in their own right. Some of the events listed are free of charge and others incur a cost. If in doubt, call before attending. We provide a list of providers/venues and their contact details at the end of the blog. If any of the details in this list are wrong, or change, please let us know and we will amend the listings. If new regular events are started up, we will be happy to add them to the list. The aim is to keep the details up-to-date, so that the blog can be an ongoing and accurate listing of Forest Gate regular events. We will notify updates via Twitter (@E_7nowandthen). We will follow this blog in a couple of blogs time with a week's eating and drinking in Forest Gate - and pretty mouth-watering it should be , too! 9.00am - 3.00pm Woodgrage Baptist church. Baby/Toddler group. 9.30am - 12.30pm Durning Hall. Tender cubs (pre-school). 10.15am Corner Kitchen. Toddler music, for the under 5's. This and other classes listed below are put on by local mums; they are drop in £5 charge. 11.00am - 12 noon. The Gate. Tai Chi in the park. Forest Lane Park, meet Magpie Lodge. 4.00pm- 6.00pm Durning Hall. East London School of Dance: ballet, modern and tap (3yrs - 18). 4.00pm - 7.30pm The Gate. Table Tennis Meet new p[eople and try your hand (children). 6.00pm - 8.00pm. Durning Hall. Shpresa Programme (mentoring and dancing workshops). 6.30pm - 7.30pm The Space East. 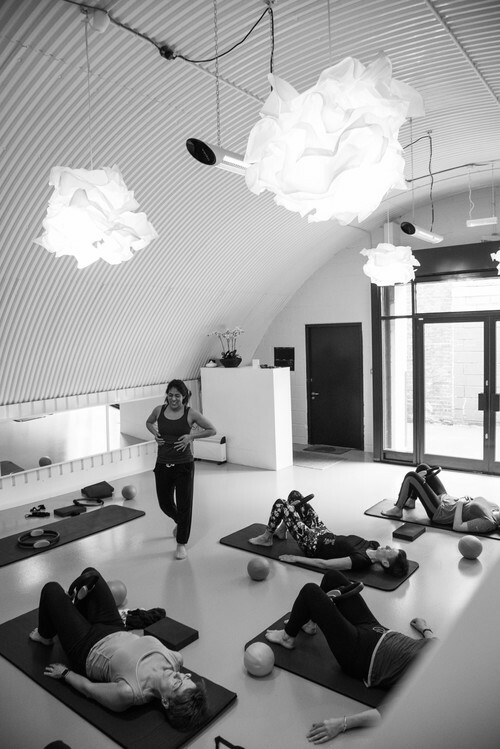 Beginners Pilates (other times available during the week, contact Space East for details and prices). 7.00pm - 10.00pm Forest Tavern. Swing Dancin' Get dancing with Swing Patrol - swing dancing; no partner required. £10. 8.00pm - 9.30pm Durning Hall. 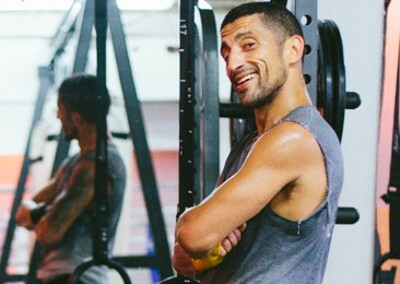 Kick boxing. 9.15 - 10.30am Space East. Beginners Yoga (other times available during week, contact Space East for details and prices). 10.00am Forest Tavern. Gate Yoga: Traditional Hatha Yoga (suitable for all levels). 10.30am - 11.30am The Gate. Story telling; story and rhyme session for children upto 5 years old. 11.30am - 12.30pm The Gate. Buggy Fit: Free guided walk to the local park with your buggy. Meet at the library. 4.30pm- 7.00pm Durning Hall. East London School of Dance: ballet, modern and tap (3yrs - 18). 5.00pm - 6.00pm Space East. Teen Yoga (contact Space East for details). 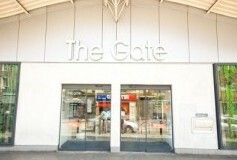 5.30pm - 7.30pm The Gate. Chess club : play, learn or get help to improve your game. All ages and abilities irrelevant. 6.00pm - 7.15pm Durning Hall. Beavers (boys 6-8). 6.00pm - 7.00pm Durning Hall Swing TrimFit. Scott Cupit's Swing Patrol branches out with a weekly swing dance inspired hour long work out. £5. 7.00pm Forest Gate Methodist Church, Woodgrange Road. Gate Yoga: Traditional Hatha Yoga (suitable for all levels). 7.30pm - 9.30pm Durning Hall. Wing Chun school of martial arts. 8.00pm - 11.00pm Forest Tavern. Pub quiz. Winner £50, second bottle of wine. 9.30am Corner Kitchen. Toddler French, for the under 5's. £5 charge. 10.00am CoffeE7, 10 Sebert Road. Gate Yoga: Traditional Hatha Yoga (suitable for all levels). 3.30pm - 5.00pm The Gate. Games club: Sony, PS3, XBox 360, Nintendo Wii, board games and much more. Free activities for the 7's - 16's. 4.30pm- 6.30pm Durning Hall. East London School of Dance: ballet, modern and tap (3yrs - 18). 4.30pm - 5.30pm. MBox. Try an under 16's boxing class with Mickey (other times available - check website for details, phone for prices - see below). 8.00pm - 9p.00m Durning Hall. Wing Chien school of martial arts. 8.00pm 11.00pm Red House, Upton Lane. Jazz@St Ants. New performers each week. Reasonable priced drinks. £3. 9.30am - 12.30pm Durning Hall. Baby massage music for the under 5's. £5 charge. 9.30am - 12 noon. Woodgrage Baptist church. Baby/Toddler Group. 3.00pm Corner Kitchen. Toddler music, for the under 5's. £5 charge. 4.00pm - 6.00pm Durning Hall. Kick boxing. 4.00pm - 6.00pm The Gate. Science Club Join the club, carry out interactive experiments, watch demos and record results. 4.00pm - 6.00pm The Gate. Children's movie club. Free screenings for children aged 7 - 16 (under 8's must be accompanied by an adult). Advanced notification of films given. Advanced bookings essential. 6.15pm - 7.45 The Gate. Yoga; exercise for physical and mental well-being. 10.00am - 4.00pm Community Garden, 138 Earlham Grove. Open for assisting or viewing: with a children's and a quiet area, for reading. You will be encouraged to sign up as a member. 10.00am Corner Kitchen. Toddler drama, for the under 5's. £5 charge. 10.30am - 11.30am Space East. Mums Yoga with babies, level 1 (contact Space East for full details). 11.00am - 1.00pm The Gate. ICT drop-in session. Learn how to create your own email account and set up a My Newham profile. 11 am. - 12.30pm The Gate. Tai Chi in the park. Low impact class, combining deep breathing and relaxation with slow and gentle movement to improve muscle strength. Forest Lane Park. Meet Magpie Lodge. 11.00am - 2.00pm Durning Hall. House of Love. Over 50's club. 12. noon - 4.00pm Woodgrage Baptist church. Lunch club and drop-in. 12.30pm - 2.30pm Durning Hall. East African Muslim cultural group. 12.30pm - 2.30pm Durning Hall. Newham Gambian Association. 1.00pm - 4.00pm. Forest Gate Community Garden, Earlham Grove, open for volunteering, or just a stroll. 1.30pm - 3.30pm The Gate. Bumps and babies - free activities for the under 5's. 4.30pm - 5.30pm Durning Hall. Think Big (drama class). 5.00pm - 6.30pm Durning Hall. Folk in Motion (wheelchair dancing for the over 50's). 6.30pm - 8.15pm Durning Hall. Cubs (boys 8 -10). 8.00pm - 9.30 Durning Hall. Scouts (boys 11 - 15). 9.30am -3,30pm Durning Hall. East London School of Dance (ballet, modern and tap; 3years - 18). 9.30am Corner Kitchen. Toddler ballet, for the under 5's. £5 charge. 10.00am - 11.30am Woodgrange Baptist church. Football academy. 10.00am - 1.00pm Woodgrange Market - corner of Woodgrange and Sebert Roads. 10.00am - 1.00pm Community Garden, 138 Earlham Grove. Open for assisting or viewing: with a children's and a quiet area, for reading. You will be encouraged to sign up as a member. 10.00am - 12. noon Durning Hall. Irish dancing academy (all ages). 10.15am Corner Kitchen. Toddler ballet, for the under 5's. £5 charge. 10.30am - 12.30pm The Gate. Homework club: free study support during term time for children aged 7 - 14. 10.45am -1.30pm Durning Hall. Tender cubs (pre-school). 11.45am - 2.30pm Durning Hall. Alcoholics Anonymous. 2.30pm - 4.00pm The Gate. Keep fit to Salsa. 3.00pm - 4.00pm Durning Hall. Wing Chun school of martial arts. 2.30pm - 4.30pm The Gate. Salsa. Dance yourself and keep fit while learning Latin and Salsa moves, without the need for a dance partner. 10.30am - 12.30pm Durning Hall. Kick boxing. 10.00am - 11.30am MBox. Try and Open Gym/Boxing circuit with Edward at MBox (other times available, check their website for times, and phone for prices - see below). 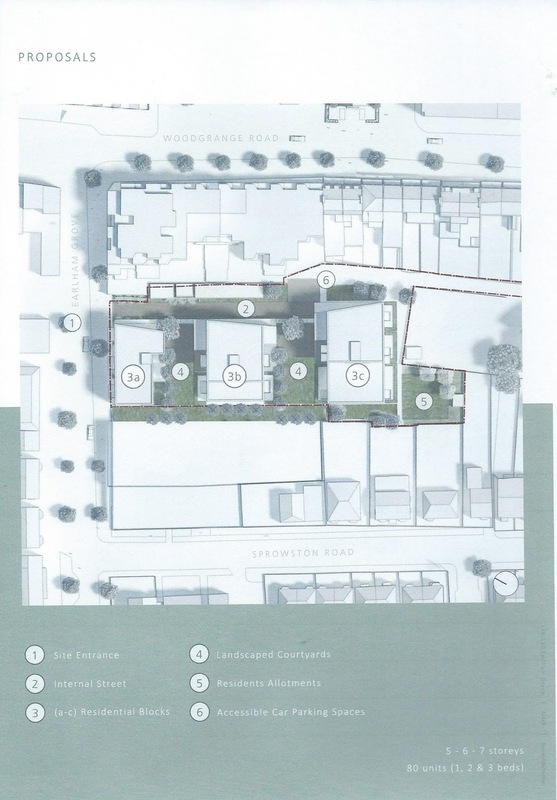 Six months after proposals for redeveloping 39a - 49a Woodgrange Road (see here for details) comes plans for an ambitious development on Earlham Grove (between the footprint for the other development referred to, above and the boundary of the Community Garden). A combination of these plans, of course, put the final nail in the coffin of the former Obsidian proposals for the area, although, as will be seen, below, there is an interesting carry through of involvement. The developments, combined, provide more evidence, if ever needed, of the massive regeneration and house price hike for Forest Gate, in advance of the coming of CrossRail to town, in 2019 (see here, for details). This proposal comes from a consortium of Mura Estates (www.mura-estates.co.uk) and the Aitch Group (www. http://www.aitchgroup.com) - which are very similar companies, sharing a Shoreditch head office, having almost identical websites and sharing involvement in a number of projects. The associated architects are Buckley, Gray, Yeoman Architects. They are a large firm of architects, with commissions across London, Britain, Europe and beyond. Like the builder/developers, they are based in Shoreditch. Intriguingly they were associated with the now abandoned and much derided Obsidian proposals for Forest Gate of 4 years ago. They haven't taken this down from their website (www.buckleygrayyeoman.com/project/forest-gate), so perhaps they still hope it is alive, or will be using aspects of it for the Earlham Grove plan. The consortium have had boards up, advertising their presence for some time. The footprint runs behind the shops on Woodgrange Road and surfaces at the gates next to Percy Ingle's on Woodgrange Road (see diagram on leaflet). This strip of land seems very thin and is probably no more than an access route proposal. 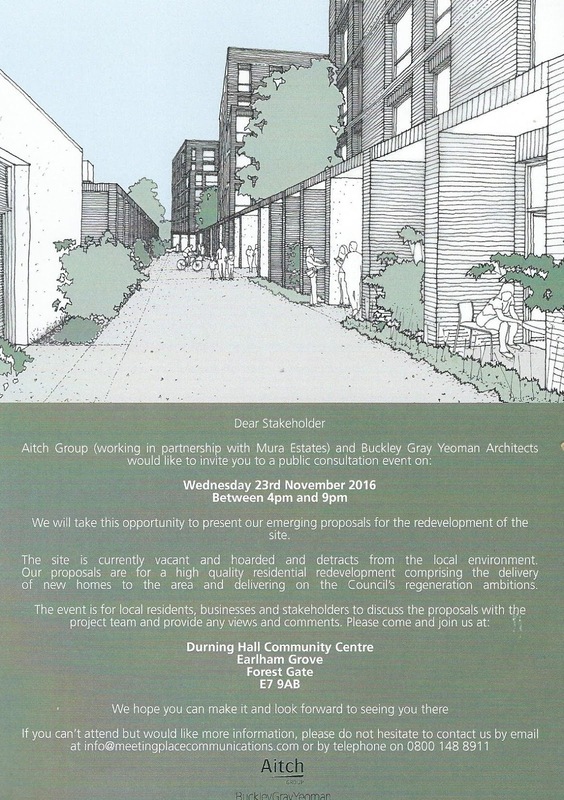 The consortium is holding a consultation evening on 23 November, at Durning Hall - see copy of leaflet, for details. 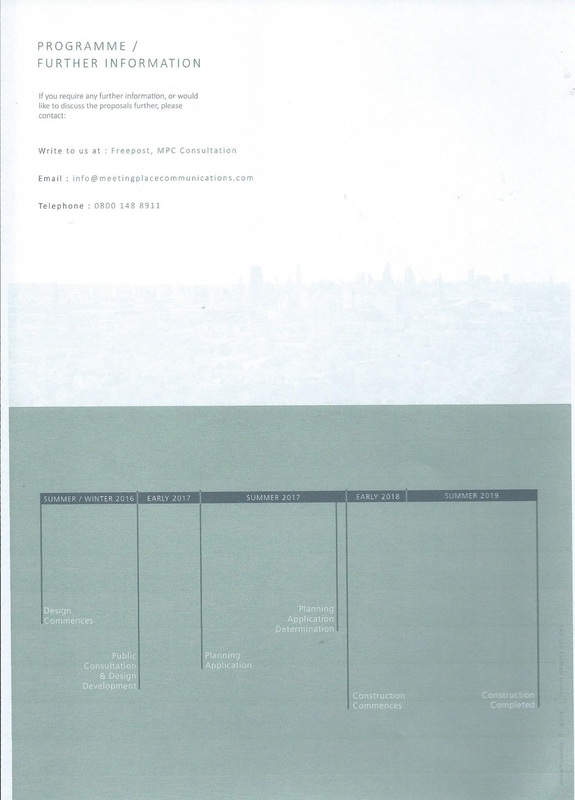 We have written to the developers offering them space on this page to lay out their proposals. We have yet to hear from them, but will treat what they say with respect - and without editorial judgement, as we feel that this is the best way of conducting a dialogue about an important project for our locality. Whether they respond or not, we will update this post after 23 November with more detailed about their proposals and projected timetable, following the consultation session, as we did earlier this year with the Woodgrange Road project. That post has attracted about 1600 page views and provoked about 30 comments. We will take this opportunity to present our emerging proposals for the redevelopment of the site. The site is currently vacant and hoarded and detracts from the local environment. 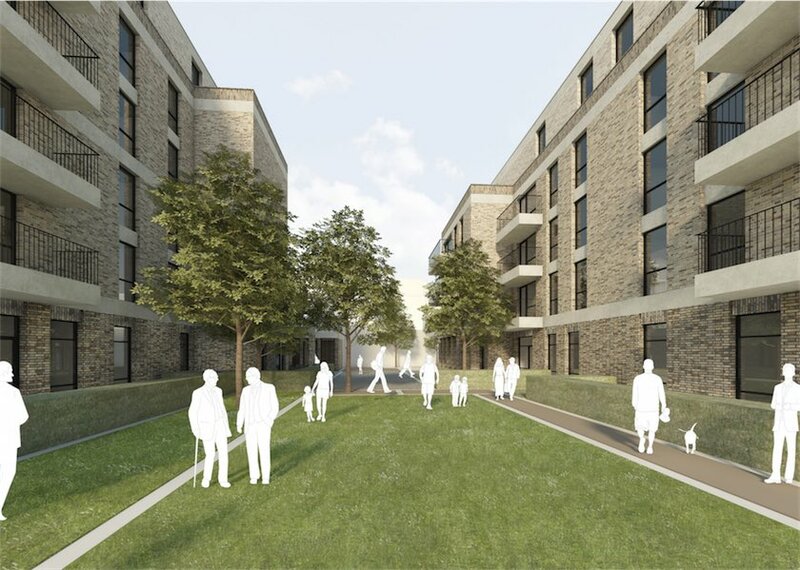 Our proposals are for high quality residential redevelopment comprising the delivery of new homes to the area and delivering on the Council's regeneration ambitions. The event is for local residents, businesses and stakeholders to discuss the proposals with the project team and provide any views and comments. We have had a quick survey of the websites of the three partners associate with the Earlham Grove project: Mura, Aitch and the architects. As noted above, Mura and Aitch overlap hugely in their profile, and in their projects too. They have been in business since 1995 and deal mainly in residential and commercial developments in London and the South East. Among the residential developments they have promoted in the East London area have been a 36 apartment block in Bow Road, just completed, with all but two flats sold (these are on the market at £500k each). 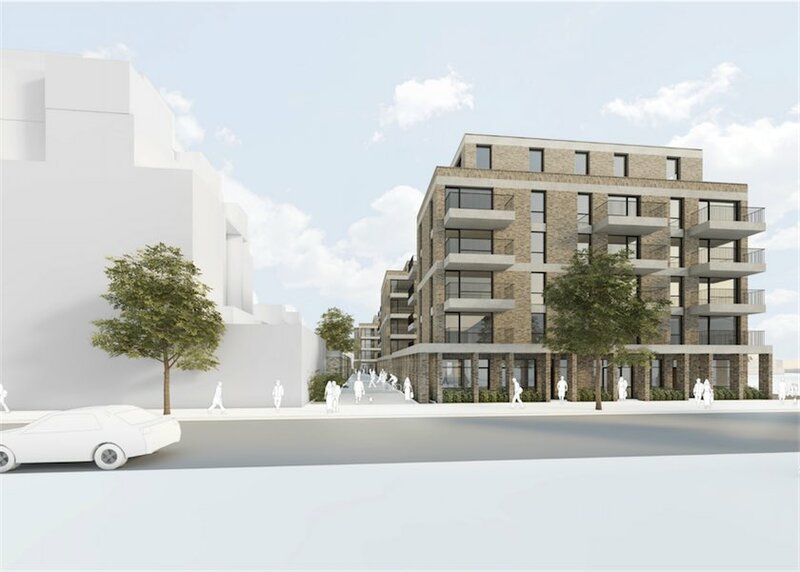 They are involved with 2 developments on Fish Island (45 residential units on Monier Road, due for completion in 2018) and 100 units on Dace Road. The architects of these were also Buckley et al. The architects, established in 1997, have a very large portfolio. They seem to be the "house" architects for Fred Perry and include their store in Westfield in their portfolio. They also undertake a number of projects for Nandos. Their other East London projects include Forest School, in Walthamstow, the Q Building in central Stratford and a development in Pier Road in North Woolwich. 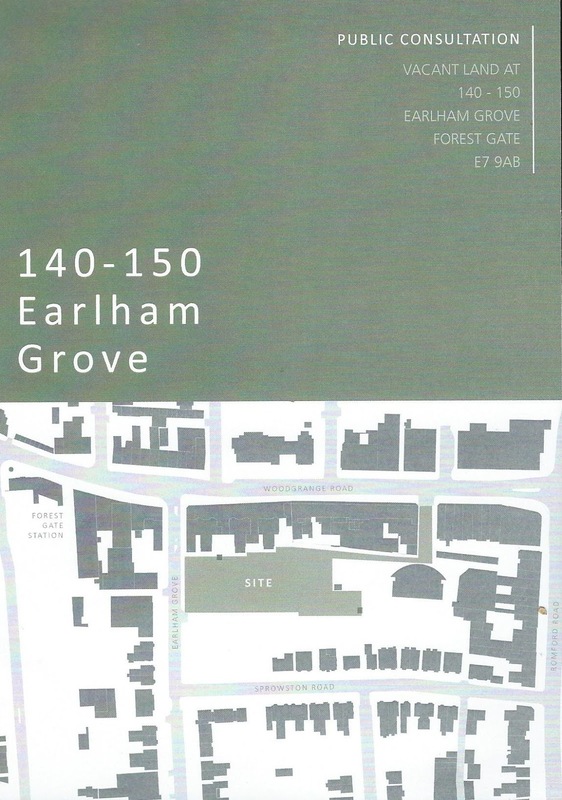 We will add further details about the Earlham Grove proposals, here, as they become available. Meanwhile, feel free to add comments below, in order to keep a healthy debate and source of information about this project live, until it is delivered, or aborted. The developers plan around 80 flats (1,2 and 3 bed), organised into 3 pods on their plot of land. Some of these will be for "social rent". The affordable/unaffordable mix is down to negotiations with the planners. Meetings with the planners are going well, as a result the developers are likely to scale the heights of their blocks of flats back from their originally hoped for 7 stories to five or six. Presumably the seven storey option was their opening bid, that they knew would get negotiated down. Because the development is behind the main (Woodgrange) Road, it is less visible to passers by, and consequently less controversial; so less interest has been expressed and fewer problems are likely to be encountered. 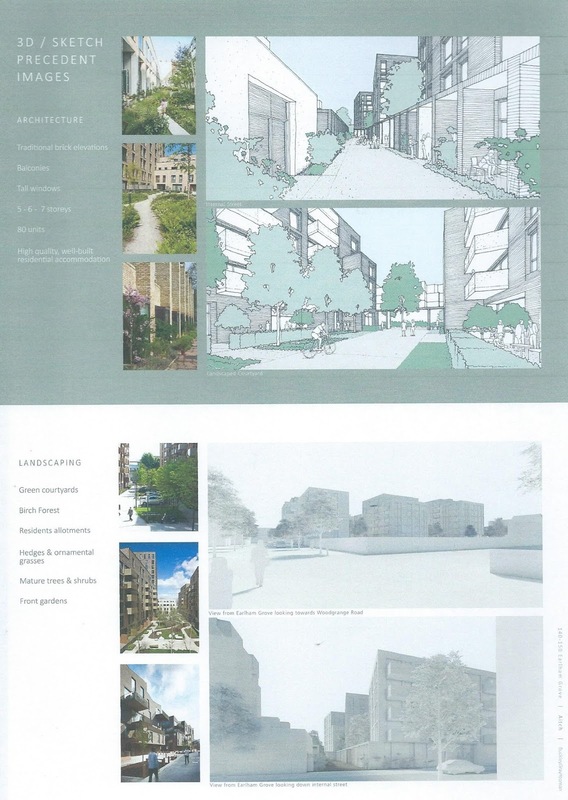 The proposed development is essentially on a brownfield site, which has already been cleared, so the lead-in time until development will be considerably shorter than that on the Woodgrange Road site, as existing tenants will not need to be accommodated and buildings demolished - should both proposals get the go ahead. This means, should both sets of plans get the go-ahead, given the advanced nature of the Woodgrange Road proposals (already submitted to the council), it is possible that building on both sites could be taking place simultaneously. This could cause congestion problems on Woodgrange Road. The "communicator" told us that early talks had taken place between the two potential developers to consider how they could minimise this. 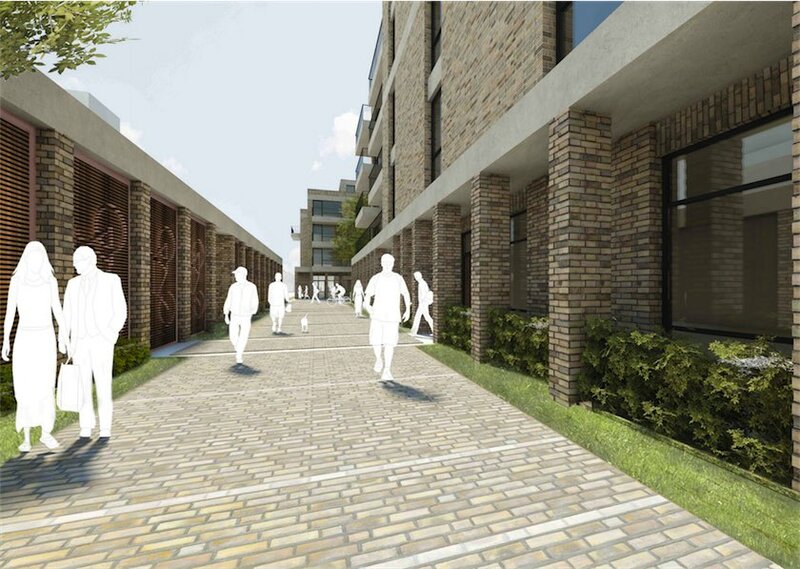 The thin corridor, shown on the first illustration, above, of the development will essentially be an access route for the rail tunnel that sits behind Percy Ingle's, on the site of the old Upper Cut club. There is another strip of land, currently held by Aston Mansfield that lies between this proposed development and the Community Garden. There are no firm proposals for this yet, but there have been preliminary discussions between these developers and senior people at Durning Hall about its longer term fate. 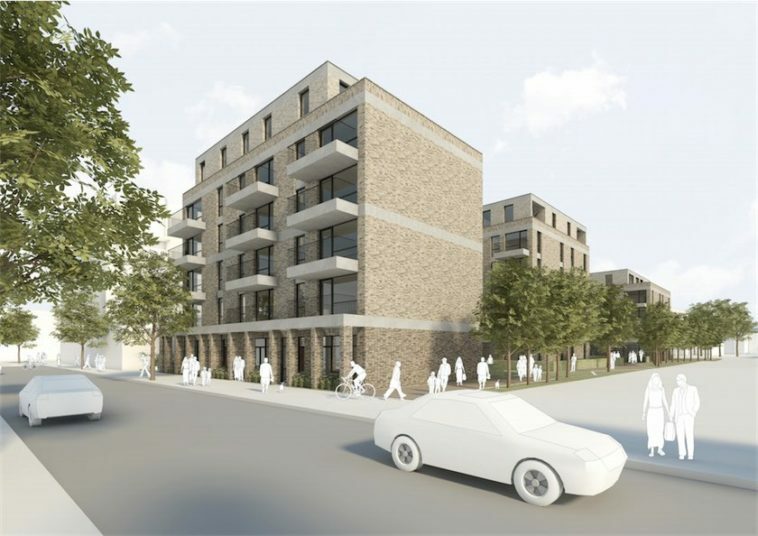 If the developers for this proposals and those for the Woodgrange Road site get their way, we will see 140 new flats - up to 6 stories in height within a couple of hundred metres of the station built - ready for the opening of CrossRail in 2019. Watch this space, and prepare to draw your breath as prices are announced! The developers have sent us copies of the exhibition boards they used in Durning Hall. We are reproducing them below. The typeface is not always clear, so we are adding the copy of each, under the image, to give viewers a clearer idea of what the developers are proposing. We encourage anyone with views about this development to engage in a discussion about it in the comments section below this post. Public consultation, vacant land at 140 - 150 Earlham Grove, Forest Gate E7 9AB. 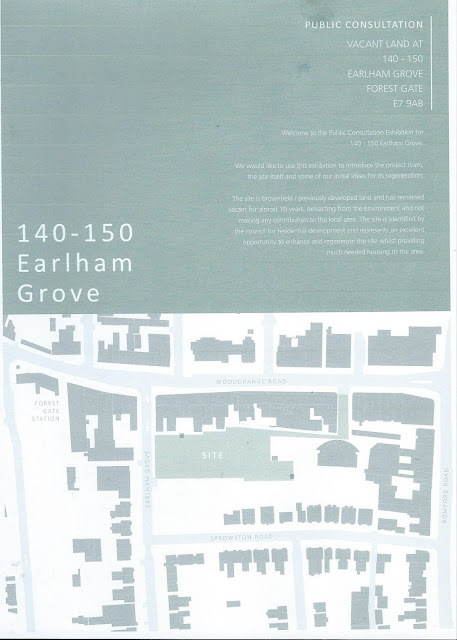 Welcome to the public consultation exhibition for 149 - 159 Earlham Grove. We would like to use this exhibition to introduce the project team, the site itself and some of our initial ideas for its regeneration. 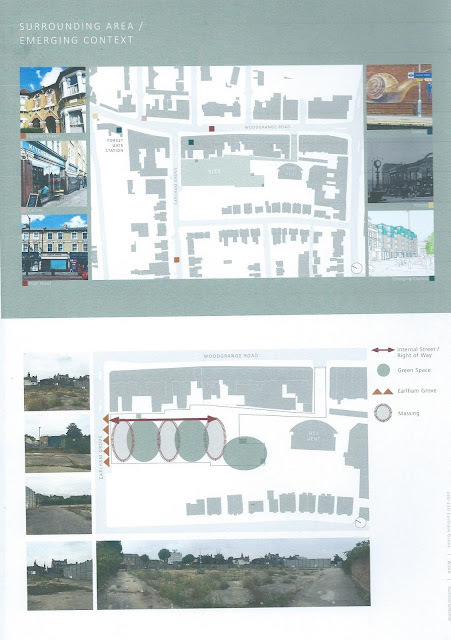 The site is brownfield/previously developed land and has remained vacant for almost 10 years, detracting from the environment and not making any contribution to the local area. The site is identified by the council for residential development and represents an excellent opportunity to enhance and regenerate the site while providing much needed housing for the area. 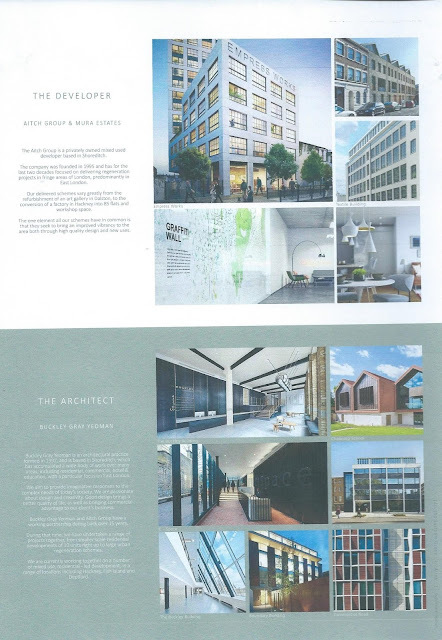 The developer is a privately owned mixed use developer, based in Shoreditch. The company was founded in 1995 and has for the last two decades focused on delivering regeneration projects in the fringe areas of London, predominantly in East London. Our delivered schemes vary greatly from the refurbishment of an art gallery in Dalston, to the conversion of a factory in Hackney into 85 flats and workshop space. The one element all our schemes have in common is that they seek to bring an improved vibrancy to the area both through high quality design and new uses. Buckley Gray Yeoman is an architectural practice formed in 1997, and is based in Shoreditch, which has accumulated a wide body of work over many areas, including residential, commercial, hotel & education, with a particular focus on East London. We aim to provide imaginative responses to the complex needs of today’s society. We are passionate about design and creativity. Good design brings a better quality of life, as well as bringing commercial advantage to our client’s business. Buckley Gray Yeoman and Aitch Group have a working partnership dating back over 15 years. During that time, we have undertaken a range of projects together, from smaller scale residential developments of 10 units right up to large urban regeneration schemes. We are currently working together on a number of mixed use, residential - led development, in a range of locations including Hackney, Fish Island and Deptford. Architecture: traditional brick elevations; balconies; tall windows; 5, 6 and 7 stories; 80 units, high quality, well built residential accommodation. Green courtyards; Birch forest; residential allotments; hedges and ornamental grasses; mature trees and shrubs; front gardens. According to Apartology, a residential development news website, Aitch Group, the Earlham Grove project leaders submitted plans to build 78 flats on the site, to Newham Council in mid March - and so are on target with their timeline (see below). The flats will be located in a series of buildings of upto six storeys high, and the proposal is that they should all be private. Presumably this could be up for planning negotiation. 20 of the flats, in the application are due to be one-bedroomed, 27 two-bedroomed and 31 three-bedroomed. Buckley Gray Yeoman are behind the designs, which featute a two-tone beige/cream and off-white brick design. The photos in this subsection of this post are taken from the Apartology website. Summer 2019 - construction completed. As a result of the consultation undertaken and having listened to local residents, Aitch have now submitted a planning application. As part of the consultation, Aitch has worked with officers at Newham Council to ensure high quality design aspirations are obtained. 78 residential units with a mix of tenures, with 10 one bedroom, 27 two bedroom and 31 three bedroom units. 136 cycle parking spaces to ensure occupants and businesses are encouraged to minimise car use. Car club membership for all new residents and restriction on CPZ permits. Public realm and highways improvements. Energy and sustainable construction to ensure high quality design aspirations are obtained. If you wish to comment on this application, all representations must include the planning application reference number (17/00467/FUL) and the site address (140-150 Earlham Grove), as well as your name and address. Anonymous comments will not be considered.